Posted: July 9, 2005 4 PM EDT -- Dennis HAS intensified to a category 4 Hurricane! IMAGE D24703: GOES-8 <> Channels VIS @ 1 km res, IR2 @ 4 km res, IR4 @4 km res <> 09/04/99 11:15 - 22:15 UTC <> Multichannel color composite movie <> Atlantic An AVI-format movie showing Tropical Storm Dennis moving toward the coast and making landfall on the Outer Banks of North Carolina. This movie encompasses 11 hours of GOES-8 data at 15 minute intervals. OSEI customers with smaller monitors may want to increase their screen resolution to at least 800X600 and view the loop in a stand-alone viewer outside of any web browser. Movie provided in AVI (1.6 M) format. This image shows the effect of Dennis on reducing the surface tempertaure of the ocean. Hurricane Dennis formed over the western north Atlantic on august 24th...about 225 miles east of Turks Island and the southeastern Bahamas. After strengthening to a hurricane on the 26th...Dennis produced near-hurricane conditions at Abaco Island on the 28th. 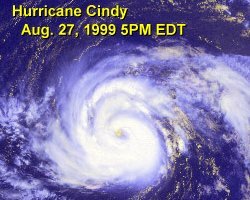 Winds increased to a peak of 105 mph later on the 28th and this intensity was maintained until early on the 30th when the hurricane was centered about 115 miles off the southeast U.S. coast. While slowly weakening...the hurricane moved to within about 70 miles south of the North Carolina coast later on the 30th. 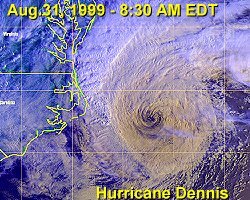 Dennis weakened to a tropical storm on 1 September while drifting slowly and erratically roughly 100 miles east of cape Hatteras. Dennis moved southward and then northwestward...making landfall in north Carolina on the 4th with winds to 70 mph. After moving inland...Dennis was absorbed by an extratropical low over New York state on 8 September. 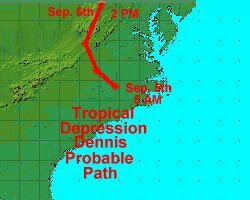 The first pass of Dennis on the 30th produced tropical storm conditions over coastal North Carolina. 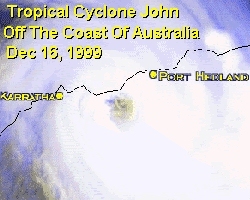 Winds to hurricane force may have occurred on the outer banks at this time. Rainfall totals reached as high as 19 inches over portions of eastern North Carolina. These rains helped set the stage for the disastrous flooding from Hurricane Floyd a couple of weeks later. Four deaths related to high surf conditions were reported in Florida. A tornado in Hampton Virginia was responsible for several serious injuries. The damage estimate for North Carolina and Virginia is 157 million dollars.